Associated British Ports has deployed 13 electric vehicles at the Port of Southampton, in a move aimed at improving local air quality in the city. 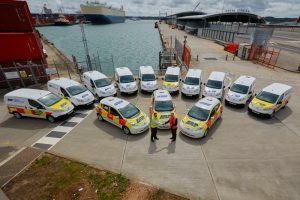 The Port of Southampton EV fleet replaces diesel cars and vans. Southampton is one of 37 areas of the UK which exceeded the EU’s 2010 nitrogen dioxide limits in 2015, and DEFRA mapping shows the areas of lowest air quality are around the port and the neighbouring A33. Compliance is not expected until 2022. The newcomers comprise 10 Nissan e-NV200 vans, and three Nissan LEAFs, supplied by West Way Nissan. These will replace diesel cars and vans and be used by staff on site. Port director, Alastair Welch, said: “The introduction of these vehicles to our fleet will not only contribute to improvements in local air quality but will also reduce running costs.